Alejandra describes a duet with Morgan on the beach in which they were working with a "location" score with a focus on transitions. 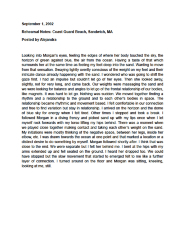 This writing was prompted by Chris Reiter who gave us a two day writing workshop in Cape Cod. Chris Reiter was working with us for a couple of days to help us find ways into the writing process and documentation of the experience of dancing in the BIRD BRAIN Osprey Migration. These journals were posted on the BIRD BRAIN web site so were edited.